Well it's that time. 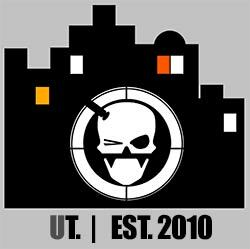 Rather than just let this fizzle and look like another un-maintained blog without reason, I just wanted to let you all know after a lot of thought, I've decided to call it a day and finish up Urban Taggers. Much has changed over the past 3 yrs in toy blaster land- when we started out in 2010, toy stores in Australia would dedicate a shelf and a half to toy blasters and the intel was barely trickling in down under at the best of times; since then its been amazing how the market has changed so much and how stores have taken notice with whole walls now dedicated to these awesome toys. I've had a few offers to take over the reigns of UT but for now.. I just don't want that to happen. It's been my heart and soul for the past few years and I guess even though I don't have the capacity to continue anymore, I probably am a little too close to my little blog to let it go to someone else just yet. SO what happens now? There's no reason to "remove" the blog, I just won't really be updating it anymore. (I probably will still admin the comments but that might take a bit of time) I still love the gear and I still use social media a LOT so I'll probably still keep the Facebook page going too if any of you wanna still say hey. There are plenty of good sources of info out there for this sorta thing, so no doubt you'll be in good hands. Thank you so much for reading. This really was an amazing experience and I'm chuffed to think I could have been a part of this awesome toy blaster world. Buzzbee doesn't have the greatest presence here in Australia, and their official website does look a little outdated but luckily we get some of our readers on the ball to send us cool stuff to view. From our Facebook page, "Braeburn MLP Fim" uploaded some things they saw at Walmart; There was an Auto Tek 20 (see after the jump) which I've seen before, but this very interesting looking Sidewinder caught my eye in a .. WHAT IS THAT? sort of way? 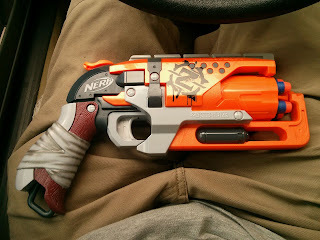 A quick google search just comes up with photos of the X-Shot Sidewinder (and of that, it's mostly pics of the blaster I sent Jerm from Nerf Mods + Reviews back in the day!) which is a different beast entirely. This one from Buzzbee looks interesting. 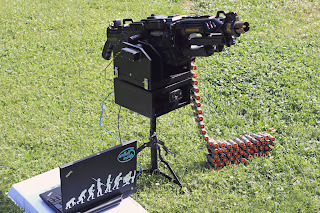 If anything, it's unique, it's something new (somewhat), and it's like a belt fed blaster but in a drum. I'm only speculating but interesting stuff! Anyone got one? Thoughts? 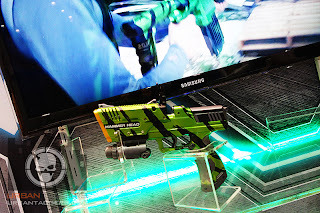 Our German friends at Bankcroft.de have gotten their hands on some of the mad new gear- in this particular case they're reviewing the upcoming new Zombie Strike Sledgefire. I'm quite a fan of this blaster from an aesthetic point of view, but what's nice is Bankcroft really break it down on how it works. 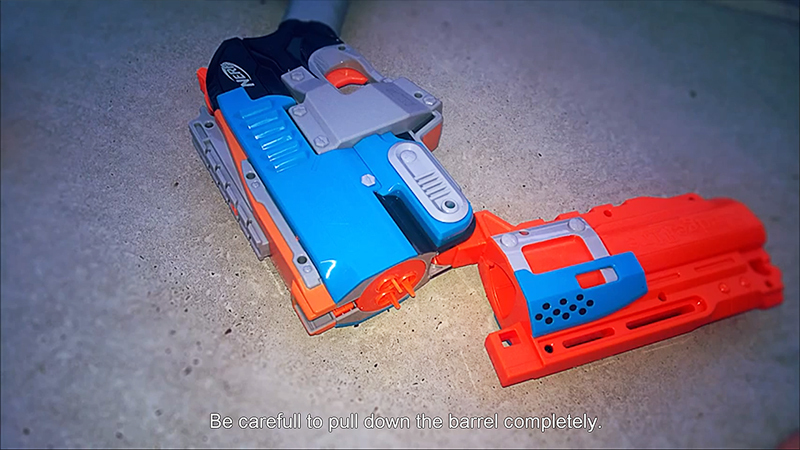 From what the video shows, it 'breaks' in half like the Barrel Break, and is designed to be a "shotgun" so it fires three darts simultaneously (apparently you can't do one at a time but then if you wanted to do that, this wouldn't be the blaster of choice) via a dart holder but luckily it doesn't 'spit' the empty shells out after you've fired like a Buzzbee Doubleshot. Another thing I find pretty interesting is another "nod" to aesthetic modders by providing cardboard stencils in the box. 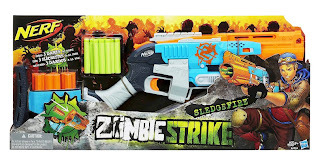 It seems like Nerf are actually promoting/urging fans to customise their own blasters with the Zombie Strike logo. Nifty! Vid after the jump. Thanks Cornelius for the link! Ahh Baidu; how those Chinese taunt us so. 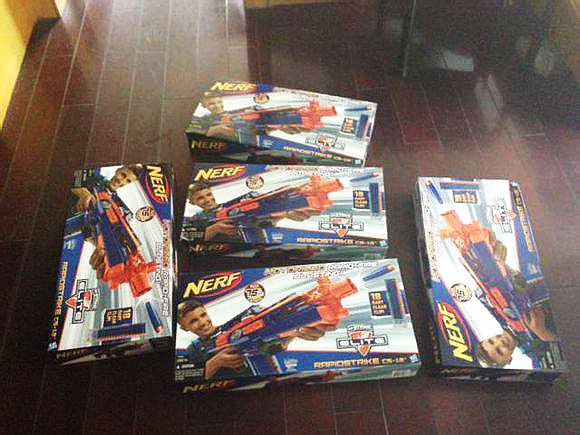 While we all eagerly anticipate the release of all the wonderful new Nerf gear, already people in China are posting photos of the blasters that they already own. There's not really any news here, it's just a pic spam round up of some images I pulled from Baidu just to make us sigh with envy:P More pics after the jump. 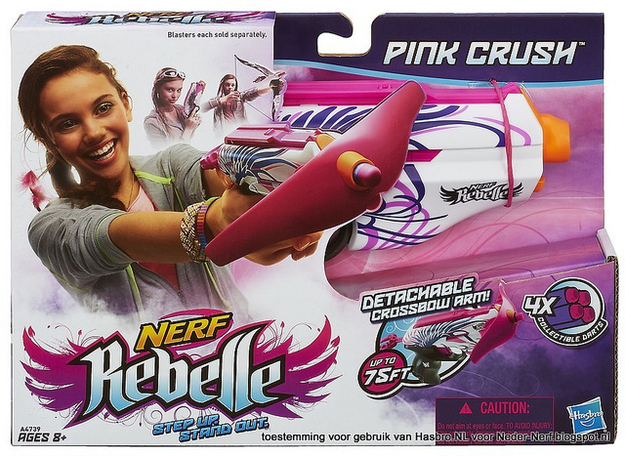 This girl has really become the face of Nerf for girls. More so than any other model. 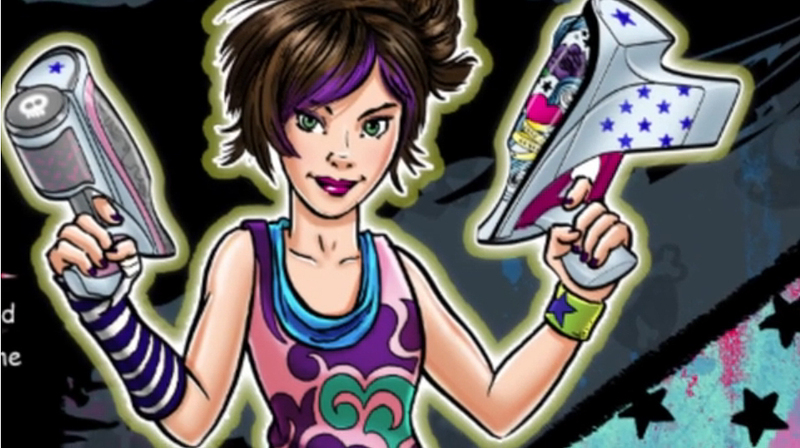 The new promo clip for the upcoming Rebelle line of "female friendly" blasters is out, and it's definitely a different approach to Nerf advertising than that in the past. Sure, it's pretty obvious there are a lot of nods to the Hunger Games with the actors running through the forest rather than urban surroundings but there's so much more to this clip that that. The interesting thing about this clip is because it's now promoting a product that's targeting girls, the message is different. And that's why I find this clip so darn interesting. Because dem marketing peeps over at Hasbro have determined that if you want to appeal to the female market, you can't just throw a mad looking product in their face and expect them to buy. 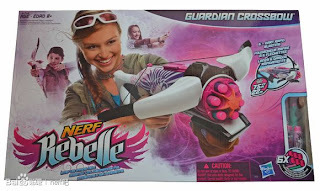 The new Rebelle line seems to not just be about pink blasters; ultimately this is about creating an image or lifestyle. 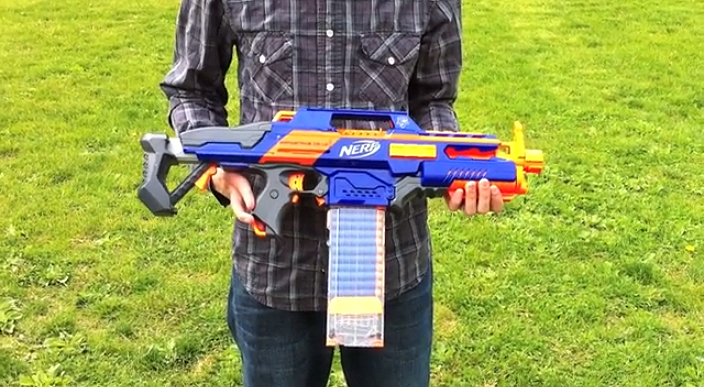 Which is probably why this clip seems less like a traditional Nerf ad, and more like one for Clearasil daily face wash. So other than the very cool looking Machete (which the tag says will be released next month in the US), we've also got these Z Bombs (not sure if they do anything other than work like throwing a Nerf football, but they also seem to come in varieties like a buzz saw? ), A reskined Jolt targeting kit and accessories like bandanas and pouches. Also gives us a look at the Side Strike's holster. All and all a great piece of intel from Atamaii! Check out the vid after the jump. Cheers JB! "the next generation is our future; they will be the ones to protect the environment and the great sport of hunting and shooting." Nerf Powerplay 2013 tournament: So much awesome in Singapore..
Singapore just seems to rock it when it comes to Nerf events. This vid from "Big Three Productions" showcases the official close quarters 3 on 3 Powerplay tournament and it looks awesome. 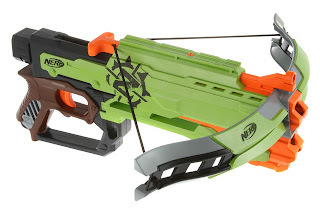 Interesting how they've integrated the N-Strike Elite gear into the Dart Tag world- we're spotting Strong Arms and Rough Cut 4x2's mixing it with Quick 16's. Check out the vid after the jump. Cheers JB for the link! Cheers Randomshadow09 for the heads up! 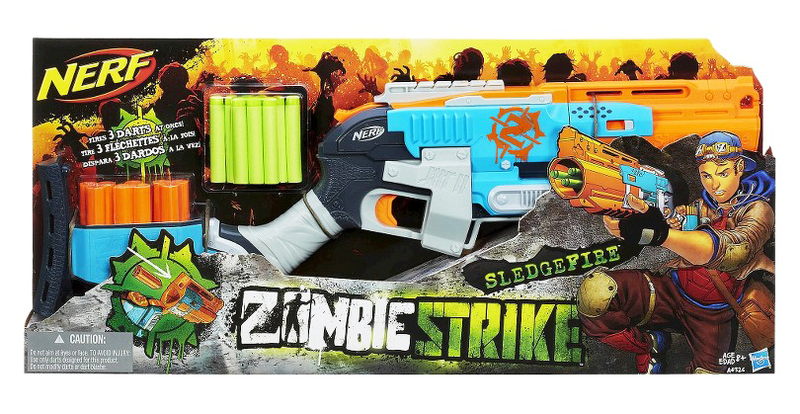 Rant: Nerf Zombie Strike 2014 lineup.. yeah cool but..
From the 2013 lineup. Preview of things to come? or not..
Ok, Straight off the bat- I'm a completionist so no doubt I'll end up with all of the new Zombie Strike gear, no question. 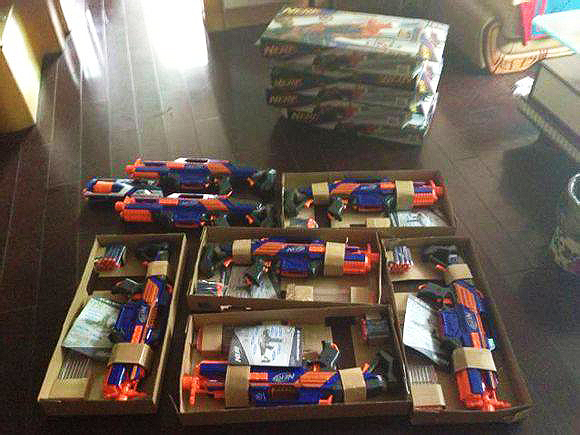 Nerf, you have my money. However, after a few hours and some sleep in between my 4am post on the new Zombie Strike kit, I've managed to sit down and really look at this new line up a little more carefully, and I have to concur with a few of the comments already made by some readers that there's something about the release of these new blasters that just doesn't quite sit right. 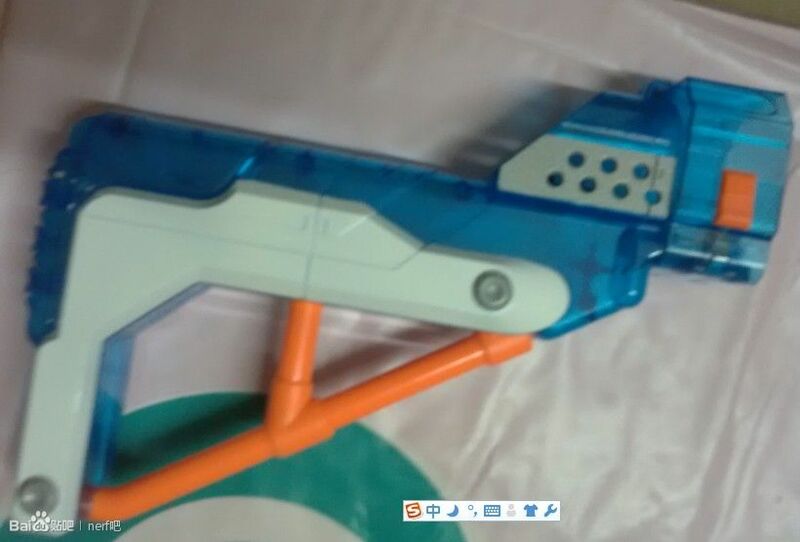 That translucent blue stock we've all been speculating on that was spotted on Baidu now has an official home; as we thought, the Retaliator is coming out in Sonic Ice finish, and by the looks of it complete with a clear clip! Spotted on the official Hong Kong Toys R Us website; Thanks to Ash from My Last Dart for the lead! The Brick Gun Book: 30 percent discount for UT readers! 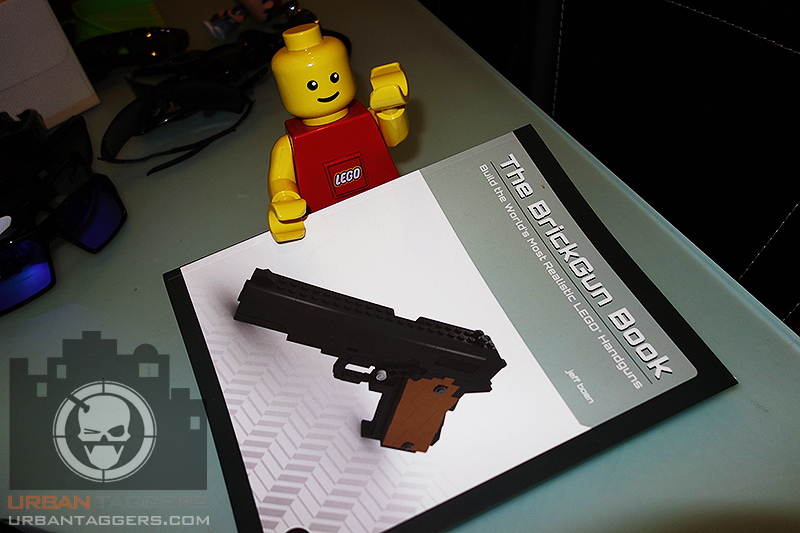 More samples of the book's pages after the jump:) Thanks Jess from No Starch Press for the coupon code! 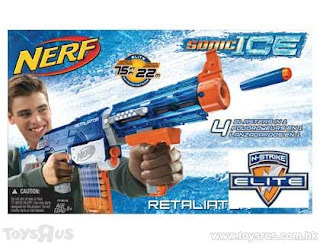 "I'd like to see translucent blue actually, that'd look priddy:)"
Well bless their cotton foam socks, Nerf have done exactly that and it looks like they'll be releasing a new translucent blue version of some their Elite blasters called "Sonic Ice". 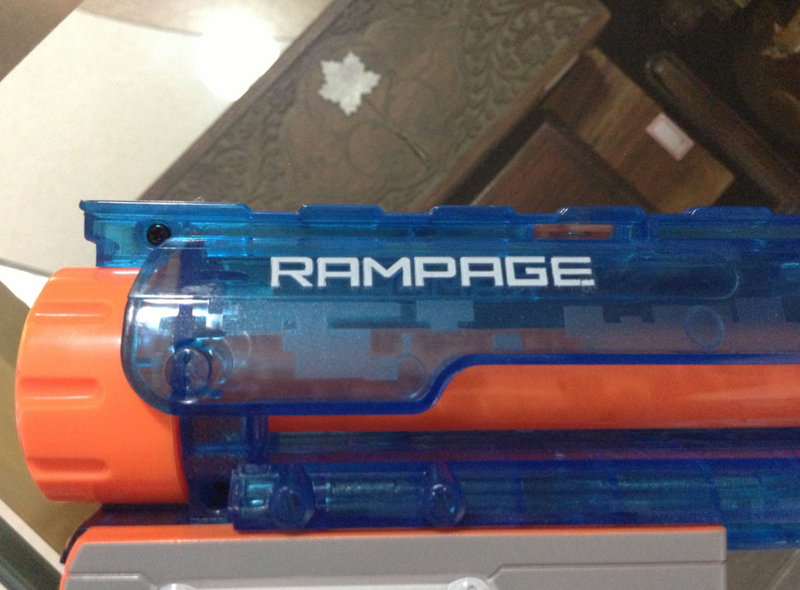 At this stage here's a bootload of pics after the jump serving as confirmation of the Elite Rampage courtesy of Baidu user Wei Ping, and the mysterious translucent blue stock floating around on Baidu suggests the Retaliator will also get the Sonic Ice treatment as well. If previous repaints are any indication, we should see something like the Strongarm and the Firestrike possible getting the Sonic Ice treatment too, but that's just me speculating. What do you reckon would make for a likely blaster to be released in translucent blue? Cheers Dave for the pics! So we all heard about the mad crazy accidental early release of the upcoming Nerf Elite Rapidstrike CS-18 in the Philippines right? What could possibly be cooler than being in the right place at the right time for when those bad boys ended up on shelves prematurely? Thanks heaps to Black Ops for the pics! 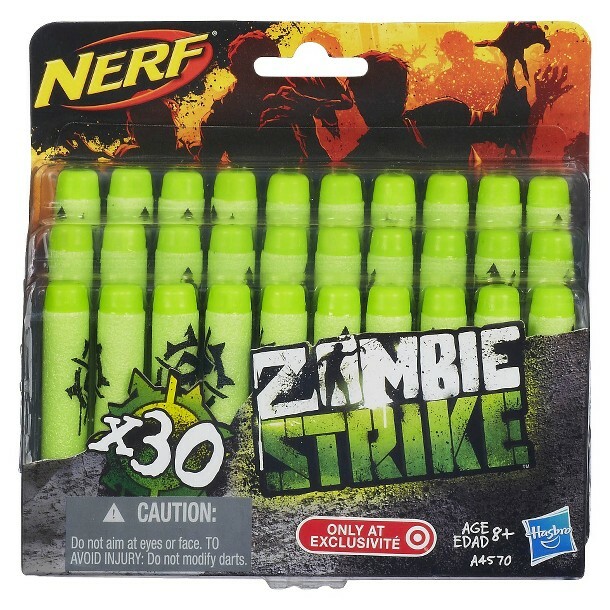 Spotted on the Target (US) website- Perhaps zombies just don't care for standard blue Elite darts. And the pink collectible darts of the Rebelle series- well you might as well just feed them your brains right there and then. 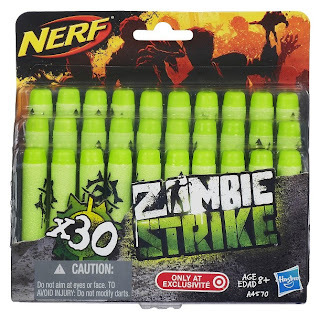 No, if you want to really take out a mean and nasty zombie horde, you have to do it with these officially badged Zombie Strike yellow darts. Yellow gets 'em every time. Just like Green Lantern. Pack of 30, for 10 bucks US. 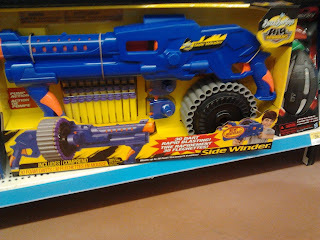 There's a strong believe out there in toyland that integrating smartphone apps to toy blasters is the next big thing. 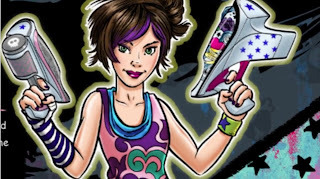 Hasbro included it with their Lazer Tag Augmented Reality line last year with limited success, but they weren't prepared to give up on the idea and have pushed it with the upcoming new "made for girls" Rebelle line and now also the N-Strike Elite series will get its own app and iOS device mount. Hasbro Australia have been kind enough to send us one of these "Mission App Tactical Rail Mount" attachments, although alas we can't really do a WHOLE lot with it given access to the free downloadable app won't be made available till August. It's also only for Apple iOS devices (and by that we mean iPhone 4 and above and iPod touch 4 and above) so that also cancels me out somewhat given I don't like Apple devices:P I can't review the app itself either, but from what the instructions say it does sound a lot less like the A.R games found in the LTARs and more like what Tek Recon are proposing. Time will tell I guess. Thanks to everyone who sent this to me; that mysterious Nerf Zombie Strike Hammershot now gets official box art to go with the images we saw a while back. Hasbro Australia made it official for us with their press release, but it looks like it's made an appearance on the official Target US website. What I'm seeing here is a new visual design here, not just in the blaster but with their box art going with more of a comic artwork feel than the traditional "grim- dude- in- black- turtleneck" design. Also noticing the bright yellow darts and the "Only at Target" badge. What's also quirky is the complete lack of PR material on the Zombie Strike line and it pops up on a Target US website just like that, whereas the Rebelle line has been very public and vocal over the past 6 months and it still hasn't made it to shelves yet. 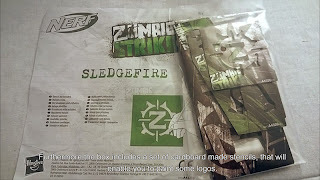 In contrast, our official info from Hasbro Australia gave us the dates/names of the Zombie Strike gear straight up, but we were given a "watch this space" word on Rebelle. Interesting huh?! It's being listed at $14.99 US so assuming it'll be under 20 bucks here in Australia if/when it's released. Keen? It pretty much addresses most of the issues already discussed about whether Rebelle is a good thing or not; I personally tend to just look at it more that "awesome new blasters coming out!" rather than worrying about whether it's for girls, boys, barnyard animals or whatever:) Have a look over at Buzzfeed- do you agree or not? Nerf "Bash at the Beach!" 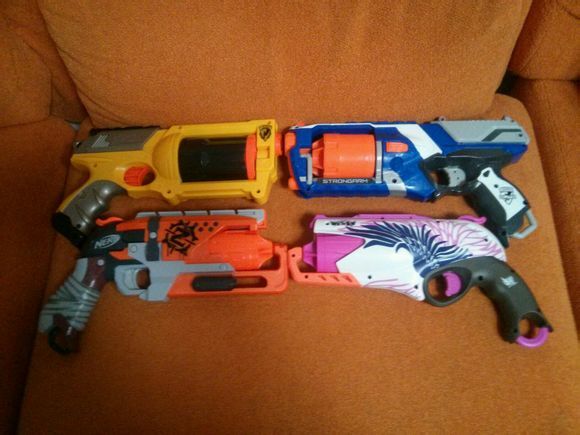 - Nerf Centurion, Nerf Rapidstrike, Nerf Revonix 360, AND the Nerf Rebelle! In the heat of battle, speed can often determine the difference between victory and defeat. With the lightweight, high-speed N-STRIKE ELITE RAPIDSTRIKE CS-18 blaster, the first fully-motorized N-STRIKE ELITE blaster, victory is close at hand! The RAPIDSTRIKE CS-18 blasts at an impressive rate of 3.2 darts per second, sending each dart flying up to 30 metres. The lightweight design and adjustable stock allow for ultimate foam blasting fun. Compatible with the N-STRIKE ELITE Clip System and comes complete with the first-ever clear N-STRIKE ELITE 18 dart clip and 18 N-STRIKE ELITE darts. Requires 4 “C” batteries, not included. Available at most major toy retailers nationwide. Launch a long-range assault with this incredible high-calibre Centurion blaster! This N-Strike Elite blaster features bigger darts that are engineered to fire farther than ever. Attach the bipod stand for even more accuracy and load up the MEGA Clip with your MEGA Whistler Darts. They scream as they fly! With a range of 30 metres and 6 MEGA darts, you can push the boundaries of your marksmanship. 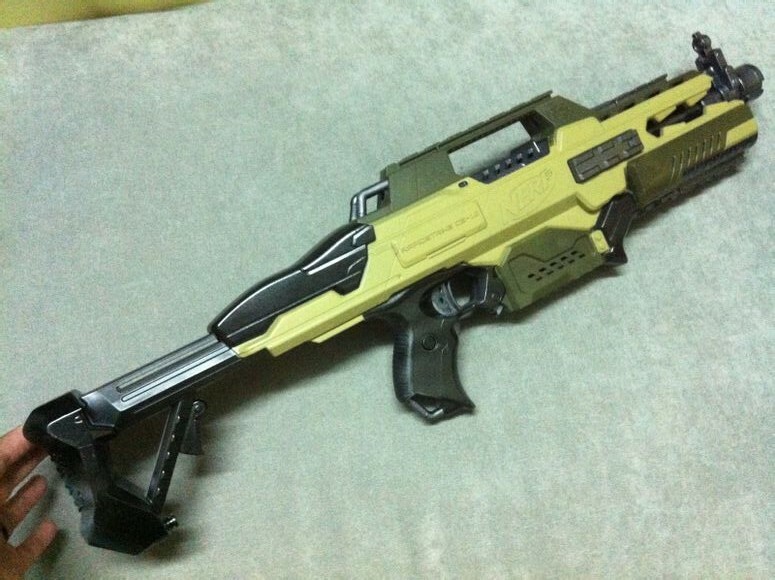 Amp up your sniper cred with the Centurion blaster! The Centurion blaster is a long-range blaster! Fires MEGA darts 30 metres! 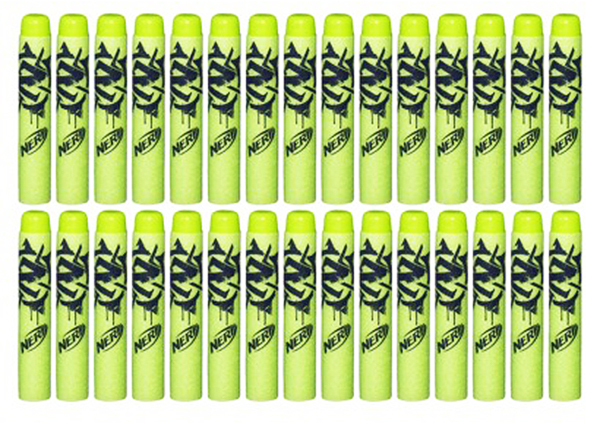 MEGA Whistler Darts scream as they fly. 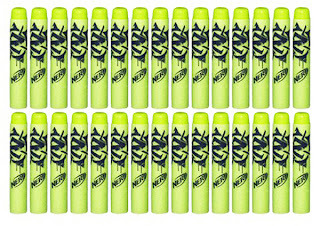 Includes 6 MEGA Whistler Darts. 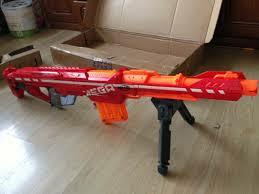 Load the darts in the MEGA Clip. Includes removable bipod stand for precision targeting! Blaster comes with 6 MEGA darts, MEGA Dart clip, removable bipod stand and instructions. Amp up freestyle foam blasting performance with the NERF VORTEX REVONIX360 blaster which achieves the farthest VORTEX distance yet, up to 20 metres! 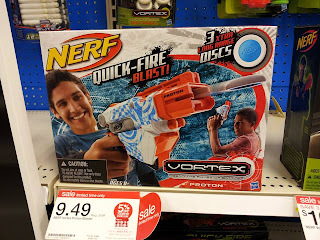 This disc blaster features new, awesome deco and has a revolving drum that rotates each time you fire the blaster.Plus, the SLAM FIRE Handle gives you total control over your rate of fire – blast a single shot or hold the trigger down and slide the handle repeatedly to unleash an unstoppable stream of discs.Includes 30 multi-color XLR discs. Available at most major toy retailers nationwide. 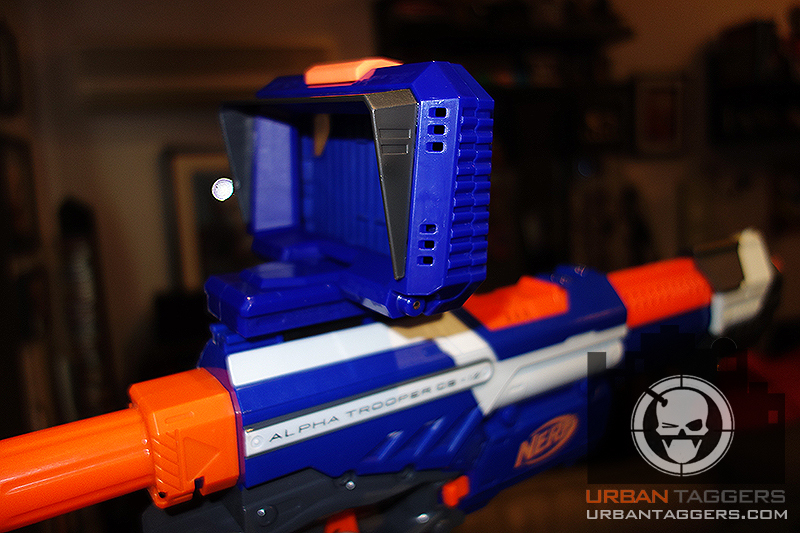 Turn your N-Strike Elite blaster into a battle cam with the Battle App Tactical Rail Mount! Download the free Nerf Battle app to your iPhone or iPod Touch and then attach your device to your blaster (devices and blasters sold separately) with the Tactical Rail Mount. Now you're ready to review mission briefs, activate the rangefinder to gauge the distance to your target, and even record the battle, all from your blaster! Battle App Tactical Rail Mount accessory lets you mount your iPhone or iPod Touch on your blaster (devices and blasters sold separately)! Download the free app and complete N-Strike Elite missions! Review mission briefs. App has a rangefinder that gauges the target distance! Record your missions! Includes Rail Mount accessory and instructions. 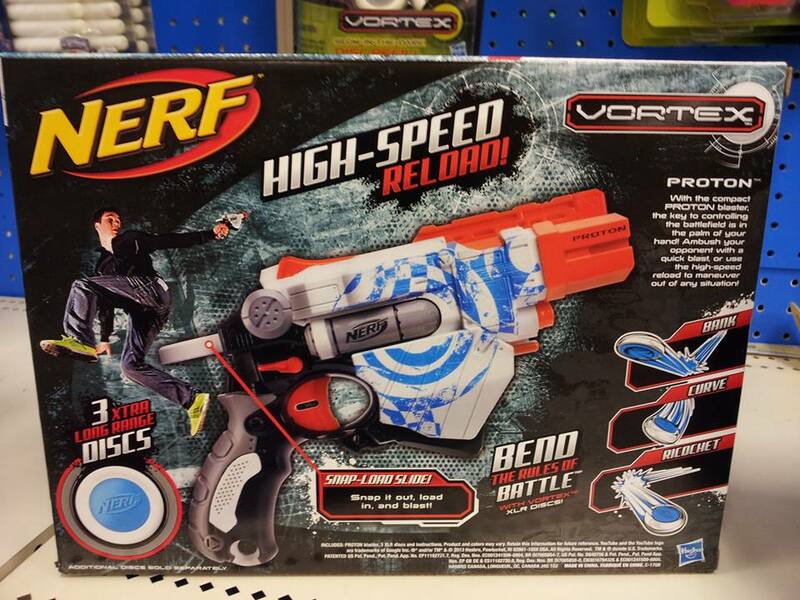 Nerf and all related characters are trademarks of Hasbro. iPad, iPod touch and iPhone are trademarks of Apple Inc., registered in the U.S. and other countries. Ages 8 and up. Note: This device is not intended to provide protection to the iPhone/iPod touch. Hasbro is not responsible for damage to iPhone/iPod touch. Blaster does not charge device. Adult assembly required. No tools needed. © 2013 Hasbro. All Rights Reserved. • Internet connection needed for app download and updates (data charges may apply). • Internet connection not needed during play. • Make sure you’re using the latest version of the app. Hasbro is not responsible for any content distributed through the App Store, except for Hasbro-generated content. Please refer to App Store terms and conditions for further information. Please note the only place this product will be available is Toys R US and they have a small allocation of 600 pieces that will sell out fast. Free App will be available globally on iTunes from 1st August 2013. There are no plans for Android at this point of time. • Battle Camera Display – Active targeting screen with features to help you while you play. Camera controls let you record video or photos of the action. Zoom function lets you zero in on targets. Rangefinder helps gauge distance to your target. Compass keeps you on course. • Missions – Guides provide different ways to have multiplayer Nerf battles. • Record your Battles – share them with friends. 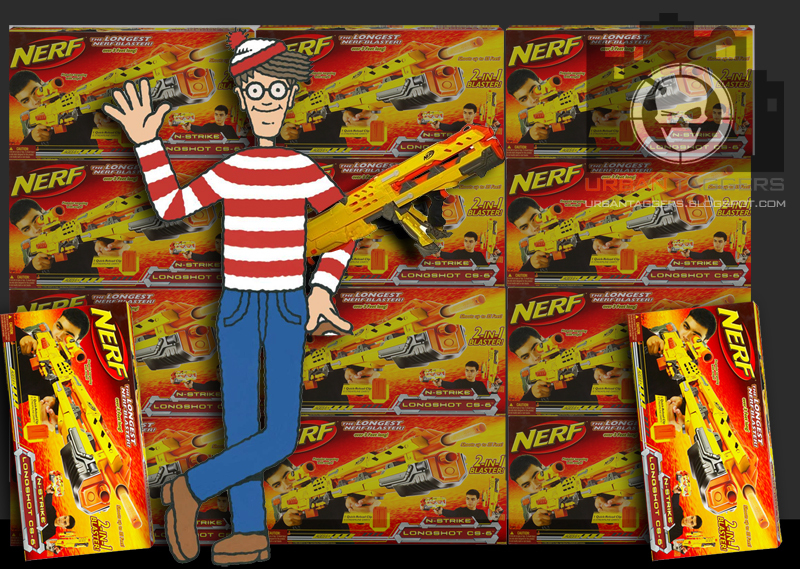 • Arsenal – Check and Track all the Nerf N-Strike Elite ™ blasters you own. • Hand Signals – See the guide for ways to silently communicate with your squad when you play. Attach your iPhone® or iPod touch® to your NERF blaster using the NERF N-Strike Elite Mission App Tactical Rail Mount sold separately! For: iPhone 4, iPhone 4S, iPhone 5, Ipod Touch 4th Gen., iPod Touch 5th Gen. 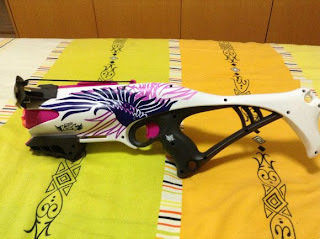 Some neat unboxing images of the upcoming new Nerf Rebelle Guardian Crossbow have made it onto Baidu. I honestly don't really care about the pink- I think it looks pretty cool to be honest. The collectible darts is an interesting slant:) More pics after the jump:) Cheers Blackops for the lead. This just in! 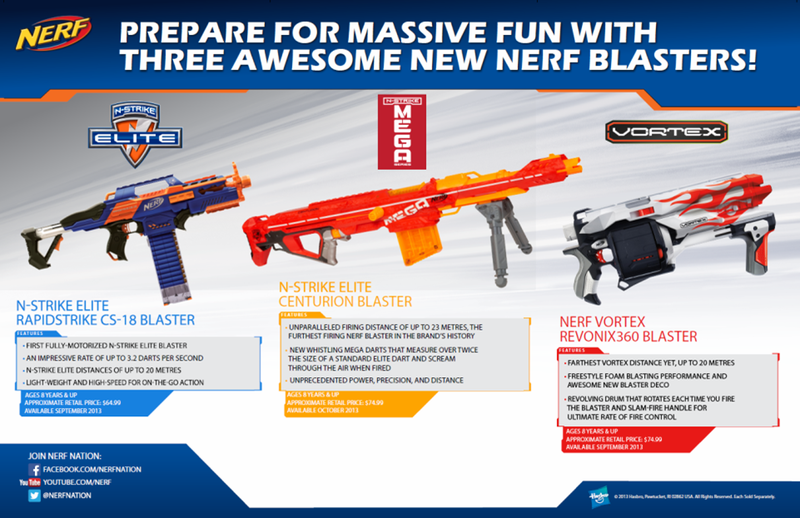 Some official intel from Hasbro on some of the upcoming release dates for the new Nerf gear. The upcoming N-Strike Elite Mega Centurion will be released in Australia in September, and will be subject to the same strict safety standards as previous N-Strike Elite kit. While the U.S version boasts up to 100ft distances, the Australian/ISO version will be badged 23m and the official word is "and any other blasters in this range" suggesting there will be more additions to the MEGA line. The N-Strike Elite Rapidstrike CS-18 should also make it to Australian shelves in September. The N-Strike Elite revisioning of the Spectre REV-5 will be available in small quantities at Toys R Us in July. 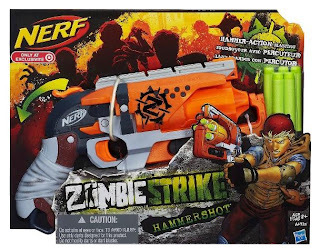 As for the upcoming Rebelle and Zombiestrike lines- as far as the Rebelle line is concerned, more info will be shared at a later date, but Target Australia will receive two exclusives for 2013 being the Hammer Shot and another blaster called the "SLEDGE FIRE". These will be available on Australian shelves in October this year. The smart phone app cradle should be available from Toys R Us stores across the country in April. 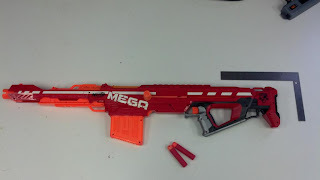 Thanks to a gentleman by the name of 'Langley', images of the upcoming Nerf Mega Centurion are available on Nerf Haven with a bootload of discussion on the fact that interestingly the Centurion is a reverse plunger blaster. 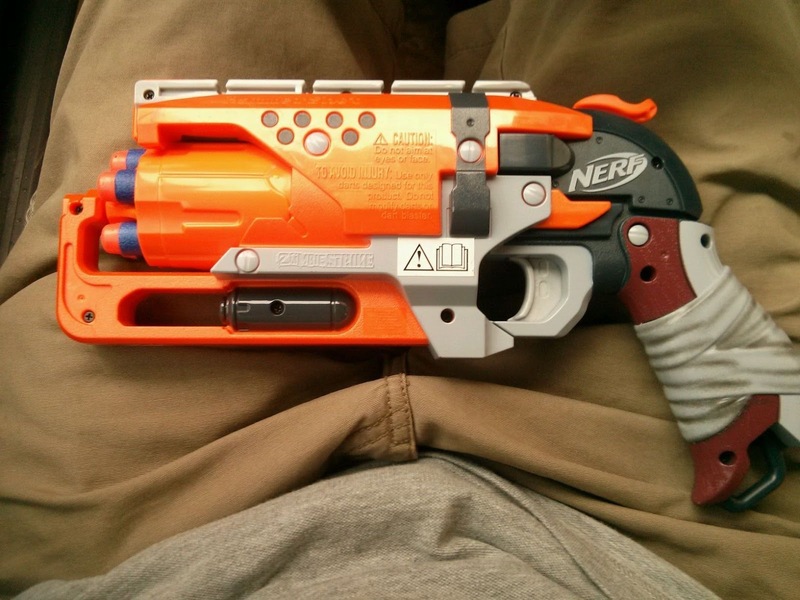 As a non modder, this doesn't mean a whole lot to me, but this could be considered a controversial decision by Nerf. I dunno, is it? More pics after the jump, or head on over to Nerf Haven to get in amongst the discussion. Thanks to everyone for the emails. Our fellow bloggers in the US have been lucky enough to be sent out the upcoming new Nerf Mega Centurion blaster for review and so far the initial responses have been okay. After the jump are two unboxing videos, one from Click Click Bamf and the other being from Basic Nerf. They're worth watching so take a look:) I've also just added my 2 cents worth on seeing these; is this the blaster you've been waiting on for this year or are there other blasters you're more keen for? Aesthetic mods on Nerf Rapidstrike- already! Wow talk about 'arms race'- while we're all speculating and crossing our fingers for when the upcoming new N-Strike Elite Rapidstrike is going to be released in our respective countries, our friends in China have already started to get stuck into the mods:) These pics show a pretty sweet paintjob- there's a fair bit more after the jump with a few glimpses of the blaster in pieces if that interests you! Cheers Blackops for the pics! It takes a fair amount of work to start up a new blaster line, let alone one for a totally new market that hasn't been explored to date. Design company Envisual put together this little video as a case study for their involvement in the upcoming Nerf Rebelle line. It's interesting stuff; I especially like the prototype drawings of the blasters:) Check it out after the jump. Cheers JB for the intel! 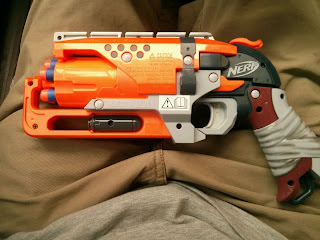 AwesomeNerfer1999 has been lucky enough to pick up a Nerf N-Strike Elite Spectre REV-5; This gives me a happy because I've always been a big fan of the Spectre. At the time it was considered by some as a lower capacity, weak imitation of a Maverick, but we did a whole up close n' personal review of it back in 2010 where with more play we found it to have its own quirks and personality that made it actually our sidearm of choice. The rumours as you can see true that it's been given the Elite treatment and while I personally welcome this update, I can't help but think it's going to struggle with its place in the new Nerf world order; we always thought the Strongarm was the lovechild of the Maverick and the Spectre, so for the Spectre to live on? I dunno how that works. STILL.. it's more than a paint job (which I might add I love) as the Spectre's reporting hot lil' Elite performances (yay!) and some subtle shell design changes. Of course, there's the attachments which was always a major drawcard to the Spectre in the first place- now in matching Elite colours. Of course there's still the whole "wtf is Nerf doing with its naming process"- this new Elite blaster maintains the identical name of its N-Strike predecessor but with Elite ranges whereas the Barrel Break IX-2 also keeps the existing name.. but is still considered to be a N-Strike blaster but with Elite colours. Confusing much? In any case, there's something about a bow, be it a long bow or crossbow that gets us all excited. Well, Nerf's upcoming Rebelle line embraces this in spades and they're bringing out a few. Here, courtesy of Baidu is a first look at the box art of the new "Guardian Crossbow"- a six round shooter that Buffy would be proud of:) Look how happy the box art model looks. She's lovin' the fact she's got a bow. More so than any N-Strike/N-Strike Elite/Vortex box art model. No grim black skivvy'd emo teen boys here. 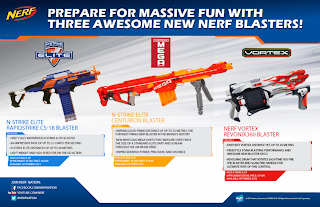 Following on from my earlier post about the dominance of Nerf and its foam dart stranglehold, imagine what it'd be like to make the gutsy move of developing your own brand of blasters in an already saturated market. What would you do? How would you go about it? 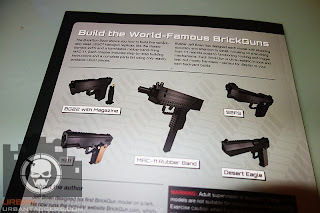 It got me thinking as it's often a point of conversation regarding "what would I do if I wanted to design the ideal blaster?" and while most of us just talk about it, sometimes some people are awesome or crazy enough to actually do it. 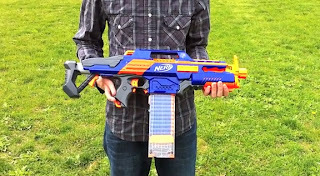 While I was writing the previous post, one line kept ringing in my head- an alternative to Nerf that may just have the goods to be a game changer in the toy blaster market. Tek Recon is the new kid on the block; well they haven't even moved in yet but the anticipation and buzz behind this new line is pretty positive thus far and better than anything I've seen in the time I've been blogging for an alternative blaster. 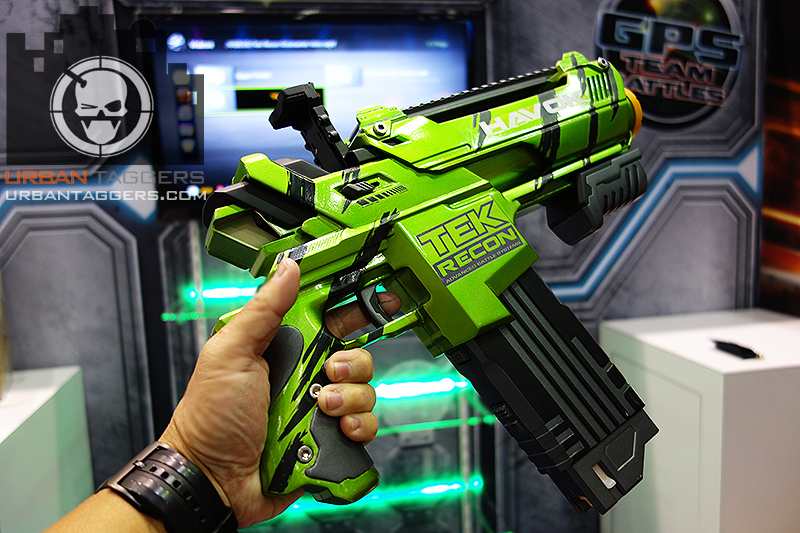 Considering all the blaster lines in the past that have come and gone, how successful do you think Tek Recon will be? 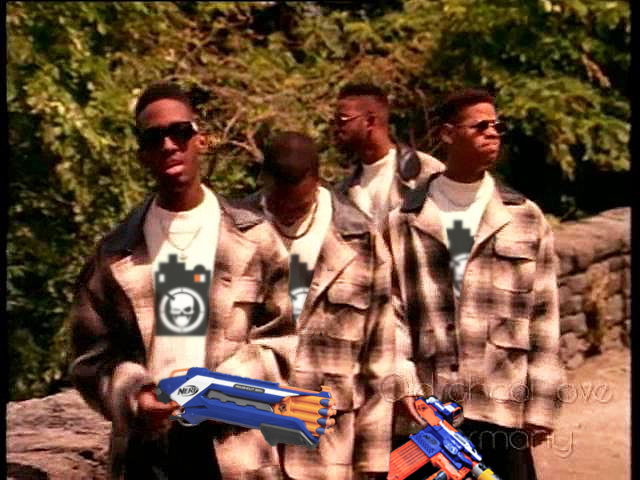 Rant: Is it REALLY "Nerf or nothin'?" 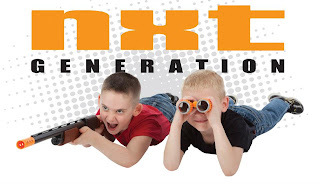 Over the last few years, new blaster lines have come and gone; they've all at the time emerged as an innovative new product hoping to claim their stake in the competitive toy blaster market and to make more than just a tiny dent in Hasbro's considerable presence. 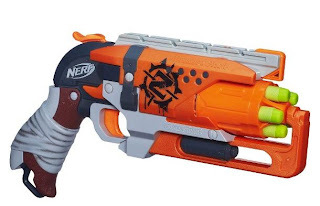 It's been a tough run though; even when good gear is released from a Non Nerf manufacturer and fans praise it, it serves as more of a novelty or "something different" for a short time before fans run back to Nerf and the gear is no longer of use. This was spotted on Baidu and it's opened up the rumour mill to all sorts of speculation as to WHAT this could mean. Sure, it's basically a Retaliator stock, but it's translucent which makes it less likely to be a fan repaint (which is always the first thing cynical nerfers cry). So, what do you think? A new elite series reshell in the works? A whole new blaster? 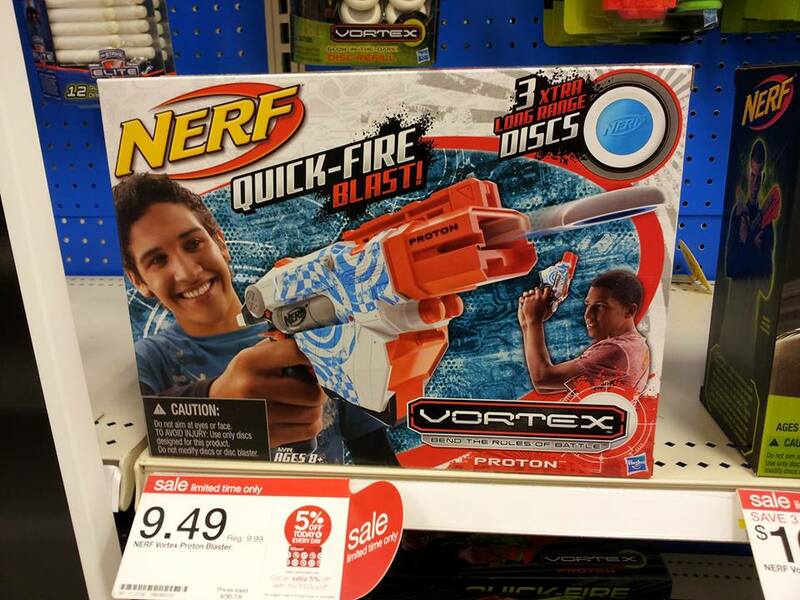 A whole new blaster line? Also on YouTube are some neat range test videos of the upcoming Nerf N-Strike Elite Rapidstrike both stock and voltage modded courtesy of Randomshadow09. Just makes us want this blaster oh that little bit more:) Check them out after the jump.